Raphael Patai Series in Jewish Folklore and A, 9780814326695, 247pp. In the second half of the nineteenth century, Jewish nationalism developed in Europe. One vital form of this nationalism that took root at the beginning of the twentieth century in Eastern Europe was the Yiddishist movement, which held that the Yiddish language and culture should be at the center of any Jewish nationalist efforts. As with most European concepts of folklore, the romantic-nationalist ideas of J. G. Herder on the volk were crucial in the formulation of the study and collection of Yiddish folklore. Herder's volk, however, denoted the peasantry, whereas Polish Jewry were an urban population. This difference determined the focus and pioneering work that this group of collectors accomplished. 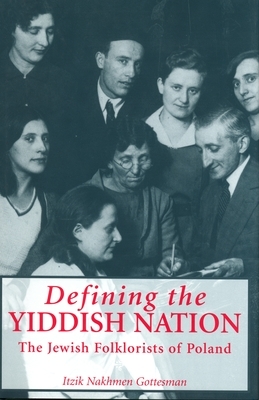 Defining the Yiddish Nation examines how these folklorists sought to connect their identity with the Jewish past but simultaneously develop Yiddishism, a movement whose eventual outcome would be an autonomous Jewish national culture and a break with the biblical past. Itzik Nakhmen Gottesman analyzes the evolution of Yiddish folklore and its role in the creation of Yiddish nationalism in Poland between the two world wars. Gottesman studies three important folklore circles in Poland: the Warsaw group led by Noyekh Prilutski, the S. Ansky Vilne Jewish Historic-Ethnographic Society, and the Ethnographic Commission of the Yivo Institute in Vilne. This book is much more than a study of the evolution of one particular folklore tradition, it is a look into the formation of a nationalist movement. Defining the Yiddish Nation will prove invaluable for scholars of Jewish studies and Yiddish folklore. Itzik Nakhmen Gottesman is senior lecturer of Yiddish Language and Culture at the University of Texas at Austin. He edits the blog "Yiddish Song of the Week" highlighting rare field recordings of Yiddish folksingers.